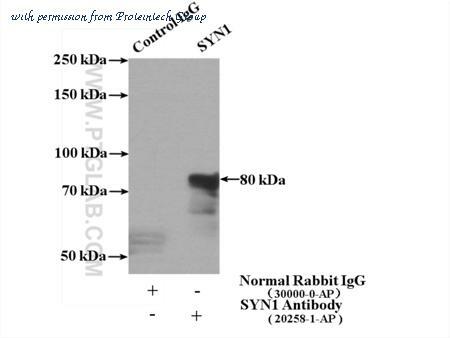 The SYN1-Specific antibody from Proteintech is a rabbit polyclonal antibody to a peptide of human SYN1-Specific. This antibody recognizes human, mouse,rat antigen. 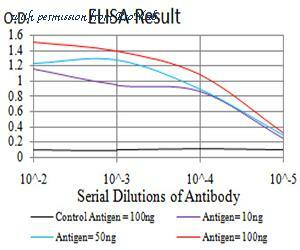 The SYN1-Specific antibody has been validated for the following applications: ELISA, IP, WB analysis. Figure 3:Western blot analysis using SYN1 mAb against HEK293 (1) and SYN1 (AA: 362-511)-hIgGFc transfected HEK293 (2) cell lysate. Western blot analysis of extracts from Hl-60 cell using Synapsin antibody. Immunohistochemical staining of rat brain tissue using Synapsin I antibody. 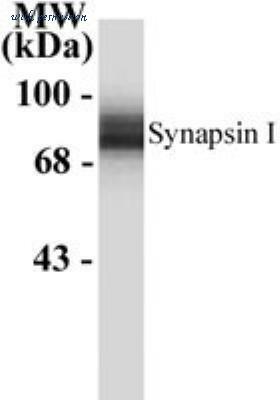 Detection of Synapsin I by Western Blot. Western blot of 10 ╡g of rat hippocampus lysate showing specific immunolabeling of the ~78 kDa Synapsin I doublet. 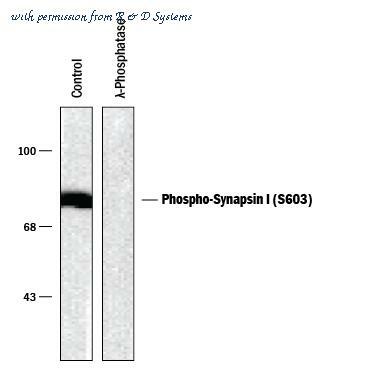 Detection of Phospho-Synapsin I (S603) by Western Blot. Western blot of rat brain lysate showing specific immunolabeling of the ~78 kDa Synapsin I phosphorylated at S603 (Control). 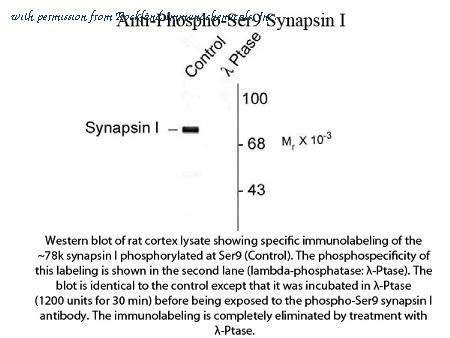 The phosphospecificity of this labeling is demonstrated by treatment with 1200 U of lambda Phosphatase ( lambda PPase) for 30 minutes before being exposed to the Anti-Phospho-Synapsin I (S603). The immunolabeling is completely eliminated by treatment with lambda PPase. 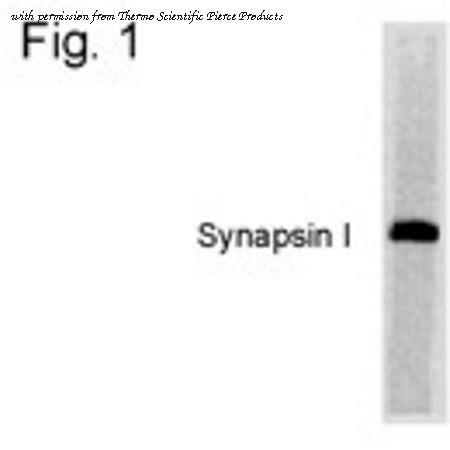 Detection of Synapsin I by Western Blot. Western blot of rat hippocampal lysate showing specific immunolabeling of the approximately 78 kDa Synapsin I doublet protein. Immunolabeling blocked by preadsorption of the antibody with the protein used to generate the antibody (not shown). Western Blot: Synapsin I Antibody [NB300-104] - 10 ug of rat brain lysate showing specific immunolabeling of the ~78 kDa Synapsin I doublet. Western Blot: Synapsin I Antibody (7H10G6) [NBP2-61895] - Analysis using SYN1 mAb against HEK293 (1) and SYN1 (AA: 362-511)-hIgGFc transfected HEK293 (2) cell lysate. Western Blot: Synapsin I Antibody (7B1D9) [NBP2-61894] - Analysis using SYN1 mAb against HEK293 (1) and SYN1 (AA: 362-511)-hIgGFc transfected HEK293 (2) cell lysate. Western Blot of Anti-Synapsin I (Rabbit) Antibody. Lane 1: rat hippocampal lysate. Lane 2: none. Load: 10 µg per lane. Primary antibody: Synapsin I antibody at 1:400 for overnight at 4°C. Secondary antibody: IRDye800™ rabbit secondary antibody at 1:10,000 for 45 min at RT. Block: 5% BLOTTO overnight at 4°C. Predicted/Observed size: ~78k, ~78k for synapsin I doublet protein. Other band(s): none. Western Blot of Rabbit anti-Synapsin I antibody. 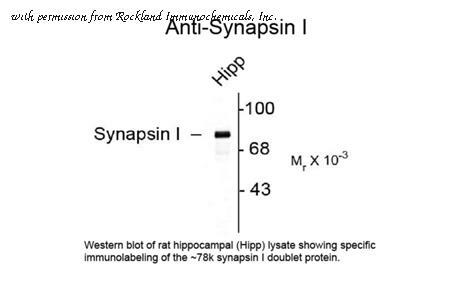 Lane 1: rat hippocampal (Hipp) lysate. Lane 2: none. Load: 10 µg per lane. 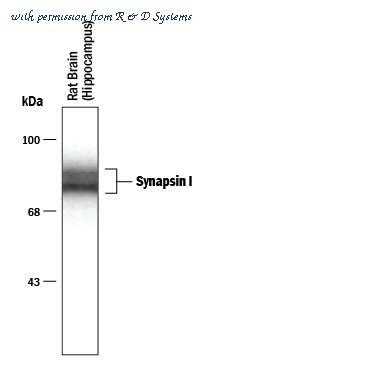 Primary antibody: Synapsin I antibody at 1:1,000 for overnight at 4°C. 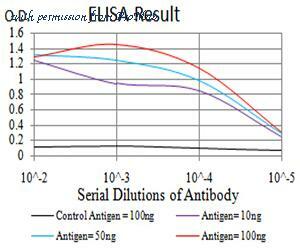 Secondary antibody: IRDye800™ rabbit secondary antibody at 1:10,000 for 45 min at RT. Block: 5% BLOTTO overnight at 4°C. 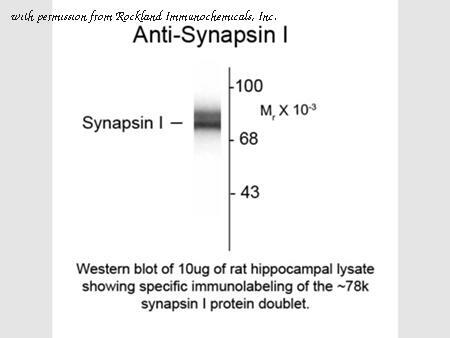 Predicted/Observed size: 78 kDa for Synapsin I. Other band(s): none. Western Blot of Rabbit anti-Synapsin I Ser9 antibody. Lane 1: rat cortex lysate (control). Lane 2: ?-Ptase. Load: 10 µg per lane. Primary antibody: Synapsin I Ser9 antibody at 1:1,000 for overnight at 4°C. Secondary antibody: IRDye800™ rabbit secondary antibody at 1:10,000 for 45 min at RT. Block: 5% BLOTTO overnight at 4°C. Predicted/Observed size: 78 kDa for Synapsin I Ser9. Other band(s): none. Western blot analysis of rat (lanes 1 and 3) and mouse brain synaptosomal fractions (lanes 2 and 4): 1, 2. 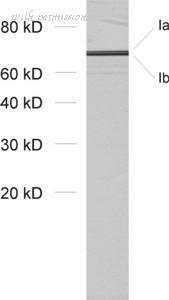 Anti-Synapsin-1 Antibody (#ANR-014), (1:400).3, 4. Anti-Synapsin-1 Antibody, preincubated with the control peptide antigen.